All transactions are safe and secure with a reliable history in online purchasing behind each of our associates. 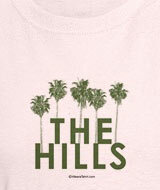 Buy The Hills Palm Tree t-shirt to own Hills clothing and merchandise. The design on the fronts of these MTV Hills t-shirts features the TV series name in front of a set of palm trees. The design captures the atmosphere of the show, which includes trendy LA boulevards with equally posh restaurants, nightclubs, and designer stores. Wear this tee on a day spent shopping at the mall or relaxing at home listening to the MTV Hills Show Soundtrack. Numerous styles and colors are available, including white, light blue, and yellow. In addition to The Hills Palm Tree tee above, browse the Hills Clothing Gallery for more apparel like men's and women's clothes, kids shirts or hoodies.